The Sonic Stadium recently held a video interview with Archie's upcoming Mega Man comic's writer Ian Flynn and cover artist Patrick Spaziante. 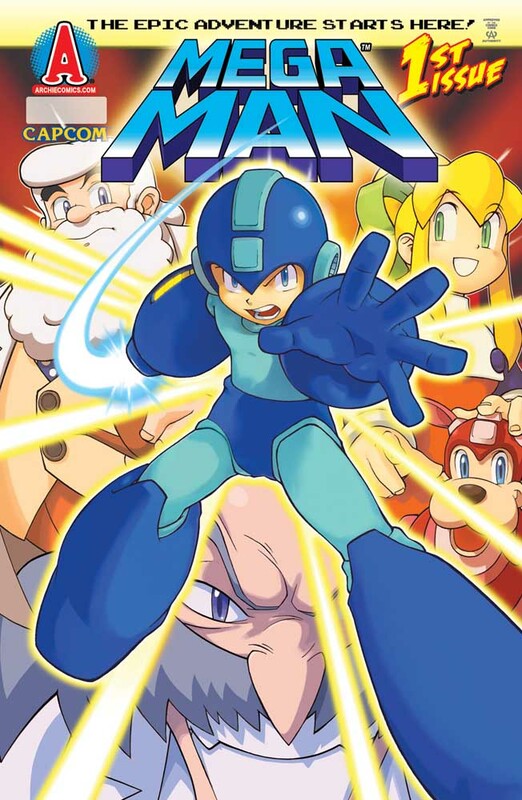 Although a majority of the interview is about the Sonic the Hedgehog comics, the end of part two and most of part three largely focus on Mega Man. You can check out the videos here, or read up on some of the more noteworthy tidbits Flynn had to say about the comic below. The comic will primarily follow the games, and will have both adaptations and original stories. First issue will focus on Dr. Wily's betrayal and Rock's transition to Mega Man. The Robot Masters won't just be killed off, and Ian wants to show what happens to them after Mega Man defeats them. Mega Man will have to use strategy to beat each Robot Master. Ian wants to do adaptations of the main entries in the classic series, the Game Boy games, and the two Mega Man & Bass/Rockman & Forte games. No Mega Man Soccer adaptation. The book will hopefully spin off into the other series (X, Zero, etc.) if it proves successful. If there are original characters, they will be supplemental. There COULD be a Sonic and Mega Man crossover at some point, but don't hold your breath. Again, most of this isn't official just yet, but still pretty neat to hear some initial details. Check out the full interview at The Sonic Stadium. Em... I think a Mega Man and Sonic crossover would kind of ruin it. I've seen many crossovers of that sort before though, and some of them were good, but not all. WOW, they wanna do the whole series. Gameboy games and all. I'm afraid of the original characters. I'm not usually all that staunch or intollerant about something like that, and I recognize that MegaMan doesn't have all that much in terms of "NPC" characters that might help portray daily life. But in this case I'm just afraid they'll ruin it with bad designs. I don't know. Anyway, the cover and latest sample art looks promising. It's got me sold on that alone. Regarding the Sonic and Mega Man crossover... I don't know about anyone else, but I think it would be pretty cool, seeing Dr. Wily and Dr. Robotnik teamn up. Adaptations of the two Mega Man & Bass games you mean they will adapt the wonderswan game too? AWESOME! i will definitely buying this! He didn't say anything about Wily Tower, or a possible Time Man and Oil Man appearance. Either way, I hope those are possible. A MegaMan Archie Comic? Sweet! "Wily's betrayal"? I wish we would move AWAY from the Localized :assistant" story by now. Jesus. What?! Sonic and Mega Man crossover?!?! Stupid idea and it will ruin everything. Oh man. I dont care. I will be fine with games from now on. No more books for me. Waste money waste papers! No Super Adventure Rockman? Or the PC titles? I know beggers can't be choosers, but this I think comes from the Sonic comic team, right? These folks are masters at bringing up forgotten obscure stuff from the sonic games (They even had the freaking Scrapped sonic 1 band in an issue.) So why not do the same for the Blue Bomber? I'm REALLY excited for this though, none the less. I have this feeling they'll mess up Wily's origin by basing it on the original Mega Man manual instead of the correctly translated newer ones. To the Anonymous guy who's saying that he's not going to buy the comic because of a possible Sonic and Mega Man crossover: You do realize that Flynn said NOT to hold your breath for it, right? It's only POSSIBLE. And even if it does happen, that's a stupid reason to not buy the comic once it starts. Glad they're keeping original characters to a minimum that was annoying in Dreamweaves canned attempt, took forever for just Heat Man to show up. But BOTH Mega Man and Bass's he seriously means the Wonderswan game?! This guy has done his homework! "Ian wants to do adaptations of the main entries in the classic series, the Game Boy games, and the two Mega Man & Bass/Rockman & Forte games." and a sonic and megaman crossover would be ehhhh. but dr.wily maybe teaming up with eggman would be funny. Then I don't think mixing Sonic & Megaman would be so cataclysmic. I would prefer it if they relegated it to a single 48-page special, but they don't make those anymore.